When organizations expand into new countries and regions, they must revamp their training deliverables for the local language and culture. eLearning translation and localization can be especially challenging, but it's a critical process in order to effectively train workers and deliver quality products and services to customers. Here are seven eLearning localization considerations to keep in mind when developing eLearning for global training projects. 1. Determine your target languages. If possible, identify at the beginning of the content creation phase which countries will use the training. Keep in mind your learning audience: who is getting the training, and what are their education levels? You don't want to create training solutions that are overly technical for learners who may not have a technical background. 2. Consider the effects of text expansion and contraction. Notice how much "likelihood of rain" expands when translated into German. When translating elearning into a language that expands, leave more open space in the English version. Localized text could expand by up to 50% in length. The takeaway: Aim to develop your global elearning with the fewest amount of words to avoid text-heavy content. 3. Account for differences in pace of narration. When using voiceover narration, keep in mind that text expansion means longer audio. To time correctly, you can add in longer pauses in the English version, and/or speed up the foreign language recording. Note that embedded video lengths may need to be adjusted to the time it takes for the foreign-language-speaking narrator to read the translated text. Whenever possible, use native speakers for any type of voiceover recording. This will ensure that your voiceover talent speaks with the same accent and uses the same dialect as your learning audience. Keep in mind that native speakers might pronounce non-translated English terms incorrectly. Terms that remain in English, such as acronyms, brand names, and cities, should be closely reviewed to ensure proper pronunciation. 5. Pay attention to cultural relevance. When targeting multiple learning audiences, avoid using any region-specific information. Instead, use internationally recognizable symbols. 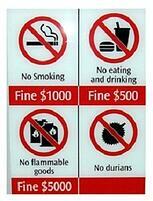 In the image at right, you'll see a sign that says, "No durians." A durian is a spiky fruit that has a bad smell, and is commonly eaten in places like Asia, Singapore, and Malaysia. Most people don't know what a durian is, so they would not understand the word or symbol. Additionally, certain symbols or gestures might mean something completely different across cultures. Take this hand signal, for instance. If you're American, you'll recognize this as signaling "OK!" But if you're Brazilian, you'll read it as "Not OK." In France, this gesture implies something is "zero" or "worthless." And in many parts of Asia, this is a sign indicating money. When developing global learning content, remember to keep it simple. Avoid using Americanisms, colloquial speech, idioms, metaphors, clichés, or expressions. Employ your in-country reviewers to verify that your images, text, and scenarios are suitable for all audiences. 6. Keep terminology consistent throughout international training projects. Translation memory also saves translators from having to retranslate repetitive content, which shortens the turnaround time. 7. Organize your files appropriately. Before sending your course for translation, you should sort out your files that are not involved in the course so you only send final files that were used to create the English. These extra files may be reference materials or graphics that will not be used. Sorting out your files will ensure that unnecessary words do not get analyzed and translated. Label/name the files clearly so that it's intuitive for what they will be used for. Thanks to advances in technology, businesses are no longer restricted by geographical limits. With these translation and localization guidelines, you can make sure that you are reaching your global audience appropriately. Interpro Translation Solutions is a multi-language, multi-platform expert translation services company. Since 1995, Interpro has partnered with organizations across numerous industries and assists them with their foreign language translation and localization needs. For more information, visit www.interproinc.com.